Safeguarding Essentials – Caught on the Net! 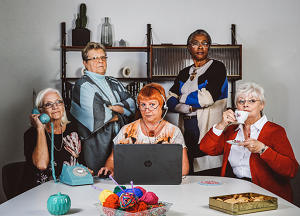 Get Safe Online has recruited unique new ‘Scammer Nana’ squad to demonstrate to youngsters how simple it is to be defrauded even by someone their grandparents’ age. TECH savvy teens who live their lives online are now more than TWICE as likely to fall victim to internet conmen than over 55’s, a surprising new study shows. More than one in ten of the youngsters polled (11 per cent), who are aged 18 to 24, have fallen victim to ‘phishing’ scams – where fraudsters access personal details though online communication – compared to just one in 20 (5 per cent) of over 55s, according to the report from Get Safe Online, the UK’s leading source of information on online safety. Despite claiming to be very digitally aware, millennials and Gen Z cybercrime victims also lose far more money in the attacks, averaging £613.22 compared to £214.70 for the older generation. In a survey commissioned by Get Safe Online, most people (38 per cent) believed that hackers were likely to be young. The same number believed they were targeted by a large international hacking organisation and almost a quarter (23 per cent) thought that advanced technical skills are needed to carry out a phishing attack. This could be why over one in ten (11 per cent) millennials don’t believe that the older generation has the skills to phish, and almost the same number (9 per cent) believe it’s ‘only old people’ who fall for phishing scams. To prove that anyone can get phished – and equally that anyone could be behind phishing – Get Safe Online trained a group of nans, dubbed the ‘Scammer Nanas’, to phish their grandkids and dispel the convictions of a quarter of young people (27 per cent) who believe they are too smart to fall for scams. Five nanas were recruited from across the UK to learn how to perpetrate a phishing email. Their schooling included faking their email address, creating false links, inventing a fake ‘company’ and writing a convincing fake email. They then put their knowledge to the test and phished their grandkids with emails with fraudulent links – proving that young people aren’t as savvy as they think. Cyber experts are blaming the rise in teenage and 20-something victims on being more trusting of online communication than older generations. Evidence from the report revealed just 40 per cent of under 25s say they ‘carefully read and re-read all emails’, in contrast with two thirds (69 per cent) of 55+ year olds who scrupulously check all online communication. Worryingly, only half of under 25s (51 per cent) don’t ‘reply to or click on links in unsolicited or spam emails’ – which is a common technique used by phishers. However, older Brits are more cautious, with three quarters saying that they never reply to or click on links in suspect emails. And three times as many 18-24 year-olds than over 55s have stopped using social media or emails as a result of phishing. Younger people are also more likely to experience longer-term damage from phishing attacks. While only three per cent of casualties over 55 reported losing ‘a large amount of money which affected my lifestyle and finances’, almost a quarter (24 per cent) of younger victims’ lifestyle and finances were severely compromised. Youngsters were ten times more likely to suffer mental health issues after being targeted, with 29 per cent saying the crime attempt impacted them compared to just three per cent of over 55s. But despite the increase in young cybercrime victims, older Brits (47 per cent) are still more likely to be targeted by online criminals compared to their younger counterparts (36 per cent). The research also looked at the frequency of phishing, revealing that almost two thirds (64 per cent) of people have received a phishing email within the last year, and one in five (19 per cent) within the last month, as cyber gangs step up activity. Worryingly, one in ten (10 per cent) has been targeted upwards of ten times. The report showed the most common phishing con is a fake email claiming to be from a bank or other financial organisation, asking for consumers to change or verify their login details. Over half (51 per cent) received this type of email, followed by 33 per cent who were sent an email from a company asking them to update logins or provide account details. Tony Neate, CEO of Get Safe Online, said: “There’s a common misconception that as ‘digital natives’ younger people are savvier and safer online. However, as our report shows, this isn’t the case. When it comes to staying safe from cyberscammers, older may actually mean wiser. Sue Parker-Nutley, one of the Scammer Nanas added: “The internet is a wonderful thing – it’s helped me to stay in touch with friends and family. However, it’s astounding how easy it can be for online fraudsters to succeed in their efforts – if I can do it, then anyone can. When asked how they dealt with the unwanted emails, over a quarter (27 per cent) reported it to an industry body and the same number to their email provider. However, one in ten (10 per cent) ignored it, one in 16 (6 per cent) panicked and one in 33 (3 per cent) even bought a new laptop in response to being targeted. To find out more, please head to www.getsafeonline.org/scammernanas or search #ScammerNana on social media.